Select a business that you believe has a good communication network. Examine its network design and explain why you think the network is effective and efficient. Recommend a better network design which can support the decisions and operations of the business if there is any. Your paper should be a minimum of three pages long APA style. Include a network diagram as reference, and at least more than two scholarly references, in addition to the text. My company of choice with a good communication network is Walmart. Walmart is the largest retail market in the world according to the Fortune Global 500 list of 2014 that was founded in 1962 by Sam Walton. The company has employed about 2.2 million employees worldwide operating chain hypermarkets, department stores and grocery stores all over the world (Fishman, 2006, pp. 5-6). Since its inception, the business appreciated customer needs thus employed impeccable customer service and the sale of products at low prices by ensuring efficient supply chain management where they implemented the hub-retail-spoke system. The system guaranteed goods were ordered, assembled and distributed at the same location and also tracked and documented in reports. In 1974, Walmart introduced computer systems and began to utilize the EDI system to communicate with suppliers about orders required and store sale information and products sold. Computer use was meant to ensure the catalog of items reconciled and was maintained by providers to the stores. Walmart business has always put a value on its distribution, inventory control and communication systems to ensure competent management. In 1974, computers were incorporated which were later replaced by the use of point-of-sale scanners that were meant to reduce the time that customers took to check out. The scanners recorded the sale of the products and reduced its quantity in the inventory to reconcile the products in the store. Since 1987, Walmart business has relied on a satellite communication system put in place as their communication network design. The system which was estimated to have cost twenty-four million dollars became the first private satellite to be used by a private company (Wang, 2006, pp. 45). The system was used to link up the headquarters, distribution centers, suppliers, and stores by ensuring direct transfer of information to and fro among them. The system constitutes of two -way data and voice communication and one-way video communication that promotes communication and reduces its cost. Additionally, it is utilized in communication whereby managers communicate at ease with all the employees and also hold meetings with different store managers concurrently. It does so by utilizing voice and computer data use and video broadcasting which are transmitted from the headquarters to all other stores. For instance, the satellite signal is used to relay broadcasts during holiday seasons concurrently as a way to boost sales. The system also links over 1,800 suppliers to Walmart (Wang, 2006, pp. 47). It facilitates timely placement of orders whereby the satellite system at a go, informs the manager of the depletion of a product, a reorder of the product is sent out to the supplier, the goods are bought, paid for and shipped to the designated stores electronically. In the instance that products cannot be shipped to the particular stores, they are availed to a central distribution location where computers powered by the satellite system sort them out, scans and bar code them ad distributed to their respective destinations. The system is also used to control the climate in different stores. The information system links all Walmart stores’ lighting, heating, and air conditioning controls to the headquarters, thereby reducing the cost of its management and use. The satellite system is efficient as it has translated the business’s operation to be instant. It cut down on cost through limited time and effort being utilized. It does so by ensuring that data, voice communication, and messages are relayed at a speed of 56 kb each second making it the fastest methods of data and communication movement as compared to 24 kilobits per second for communications through the telephone (Wang, 2006, pp. 47). Also, increased speed is witnessed during credit card approval that translates to expedited customer service thus attracting more customers due to efficient service provision. Utilization of this system to order and pay for products ensure that there is a constant supply of different products at all time that promotes customer satisfaction and effectiveness. Sharing of videos to be broadcasted in the stores, as well as, information sharing has become faster as now they are electronically sent as opposed to mailing them to the respective store. Therefore, with these improved aspects Walmart has benefited from increased sales, reduced service cost and time translating to profits for the business. Implementation of the satellite system by Walmart has resulted in over 100 billion dollars in sales as compared to sales made in 1985 of 8.5 billion dollars. Further, its utilization of the wireless networks has enabled it venture in the social media platforms such as Facebook, Twitter, and use of websites to market and sell their products. These social media platforms have therefore widened the market for Walmart’s products as customers can familiarize themselves with products sold at the stores, as well as, link with the management in case of clarifications. Henceforth, the reliance on this system for communication is evident to the efficient, cost efficient and profit earner hence; Walmart should maintain the satellite communication network. Walmart communication network diagram (Wal-Mart Supply Chain Source, 1992, March–April 2, pp.60). Fishman, C. (2006). The Wal-Mart effect: How the world’s most powerful company really works, and how it’s transforming the American economy. New York: The Penguin Press, 5-23. Wal-Mart Supply Chain Source. 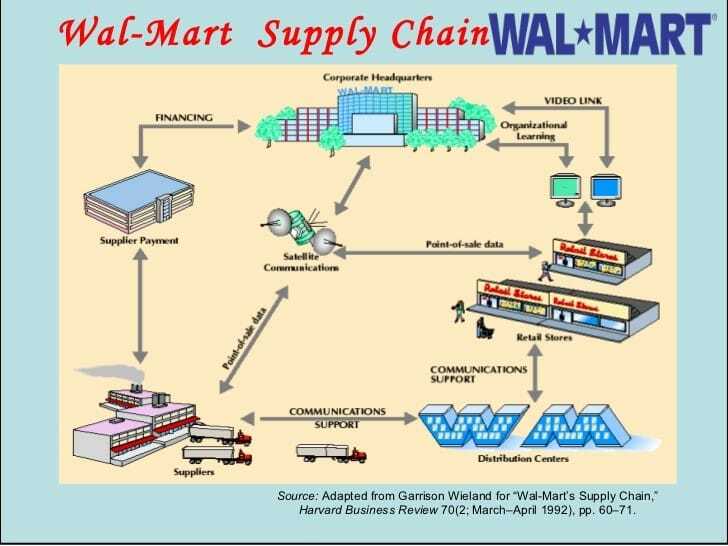 (1992, March–April 2), Adapted from Garrison Wieland for “Wal-Mart’s Supply Chain,” Harvard Business Review 70 pp. 60–71. Wang, J. (2006). Economies of IT Systems at Wal-Mart-An Historical Perspective. Academy of Information and Management Sciences Journal, 9(1), 45-66.